“Common Enemies” — After someone breaks into Luis Delgado’s (Lou Diamond Phillips) home and kills his wife, Luis and Danny team up to take down the vicious murderer who may also be responsible for Linda’s death. 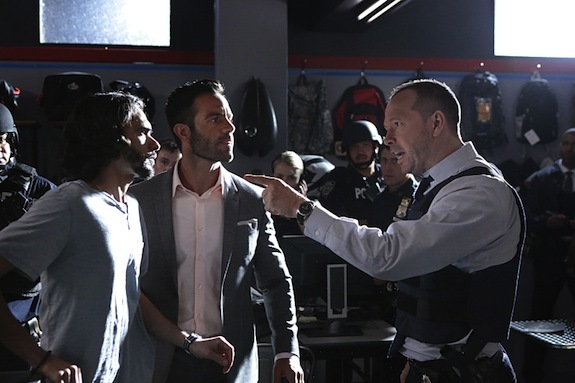 Also, Frank finally meets Eddie’s mother, Lena (Christine Ebersole), and Jamie and Erin are at odds after Jamie seeks her help charging a man who confessed to him while under the influence, on BLUE BLOODS, Friday, April 12 (10:00-11:00 PM, ET/PT) on the CBS Television Network. 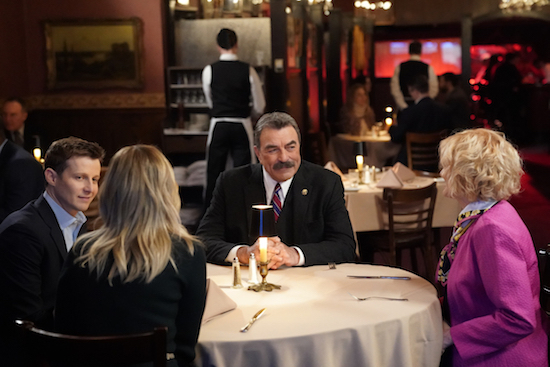 Pictured: Will Estes as Jamie Reagan, Tom Selleck as Frank Reagan, Christine Ebersole as Lena Janko, Vanessa Ray as Officer Eddie Janko. ÃÂ©2019CBS Broadcasting Inc. All Rights Reserved. CBS has added to its 2018-2019 lineup with 11 more shows getting the official pickup for next season. BLUE BLOODS, BULL, HAWAII FIVE-0, MADAM SECRETARY, MACGYVER, NCIS: LOS ANGELES, NCIS: NEW ORLEANS, SURVIVOR, THE AMAZING RACE, 48 HOURS, and 60 MINUTES have all earned a renewal from CBS. They join the already-picked up THE BIG BANG THEORY, YOUNG SHELDON, MOM, NCIS, SEAL TEAM, and S.W.A.T. Of course, a number of shows remain in limbo, including SCORPION (which just had a cliffhanger finale), CRIMINAL MINDS, KEVIN CAN WAIT, and MAN WITH A PLAN. CBS has set finale dates for the 2017-2018 season. SCORPION kicks things off on Monday, April 16th, and the finales continue for another month-plus, when SURVIVOR ends on Wednesdays, May 23rd. Additionally, CRIMINAL MINDS, MOM, NCIS: NEW ORLEANS, LIFE IN PIECES, and NCIS: LOS ANGELES will have supersized finales. Erin’s attempt to convict a slippery mob boss for an old murder is muddled when her former informant, Vincent (Dan Hedaya), leaves witness protection to provide his old boss with an alibi. Also, Frank finds himself in a departmental war with Commissioner of the New York City Fire Department, Stan Rourke (Dan Lauria). It’s time for Friday edition of SNAP JUDGMENT! We pick our favorite promotional picture from the new television episodes airing that night and we’ll showcase it here. Then, you guys can speculate what goes down in the scene/what you’d like to see happen/caption the pic however you want in the comments section. No pressure if anyone is wrong — it’s all for fun. So which photo amused us today? CBS has released teases for its returning shows’ upcoming season premieres. 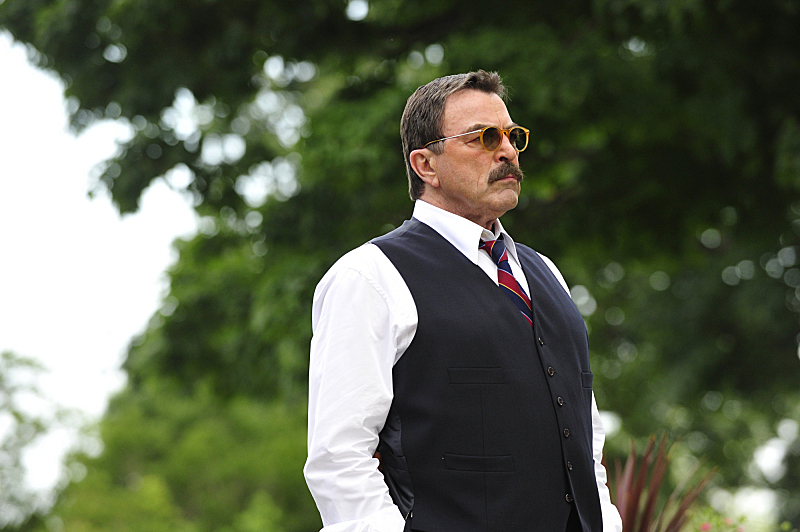 "Unwritten Rules" -- Frank (Tom Selleck) visits the graves of fallen police officers, after reflecting on a recent armed robbery that ended with the death of an NYPD police officer, on the fourth season premiere of BLUE BLOODS, Friday, September 28 (10:00-11:00 PM, ET/PT) on the CBS Television Network. Photo: John P. Filo/CBS ÃÂ©2013 CBS Broadcasting Inc. All Rights Reserved.